OnePlus continues to release flagship-level specs and power at a fraction of the price you’d expect. The OnePlus 6T is the latest and it’s packed with tons of power, an amazing camera, and a new notched, bezel-less design. Here’s absolutely everything you need to know about the OnePlus 6T. 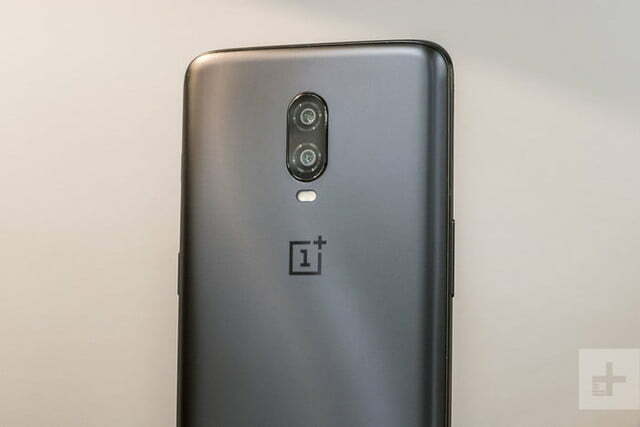 The OnePlus 6T is the first time OnePlus’s phones have come to a major U.S. carrier, but that partnership comes with some downsides, too — namely, slightly slower OS updates. However, T-Mobile is catching up, thanks to the release of Oxygen OS 9.0.4 for the carrier’s OnePlus 6T units. This update brings with it security updates to November 2018, an improved Nightscape mode, and refinements for the in-display fingerprint scanner. The update is being pushed out to T-Mobile owners, and if you’ve not received it, it’s worth checking Settings > System > System update > Check for update to make sure you’re up to date. T-Mobile OnePlus 6T units are still an update behind though, with Oxygen OS 9.0.5 having already rolled out to unlocked 6T owners. That means T-Mobile 6Ts will still lack the ability to quick-launch Google Assistant with the power button, but they can probably live with that for now. 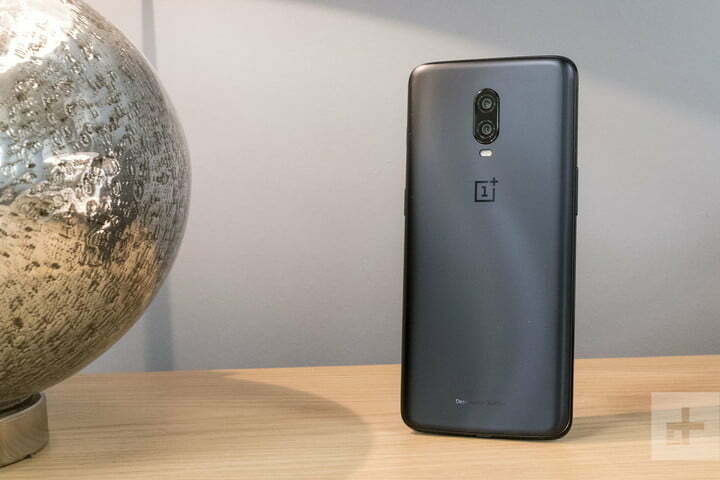 OnePlus released the OnePlus 6T in two colors — midnight black and mirror black — but may have a special edition waiting in the wings for future release. 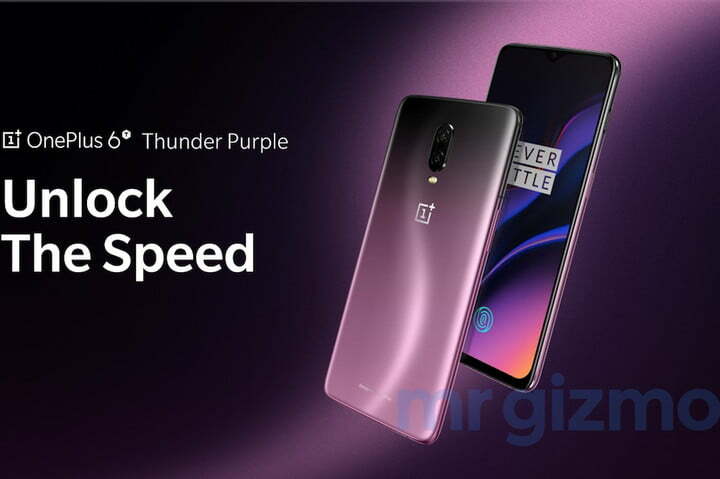 A series of legitimate-looking promotional photos of a more colorful version have been leaked, showing the OnePlus 6T in thunder purple. It certainly looks striking, with a gradient style reminiscent of Huawei’s twilight color, and considerably more visually eye-catching than the black versions we have so far. 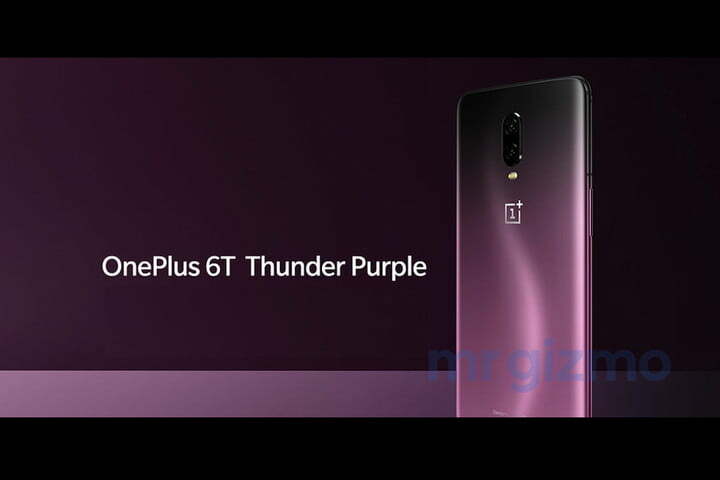 OnePlus often produces limited editions of its phones, which are sold in only some markets, and reference to a thunder purple OnePlus 6T has been spotted on the company’s support website in India. This would be the first purple phone we’ve seen from the company. However, there’s no official information yet, so this may be a clever fake, or an abandoned alternative not used. 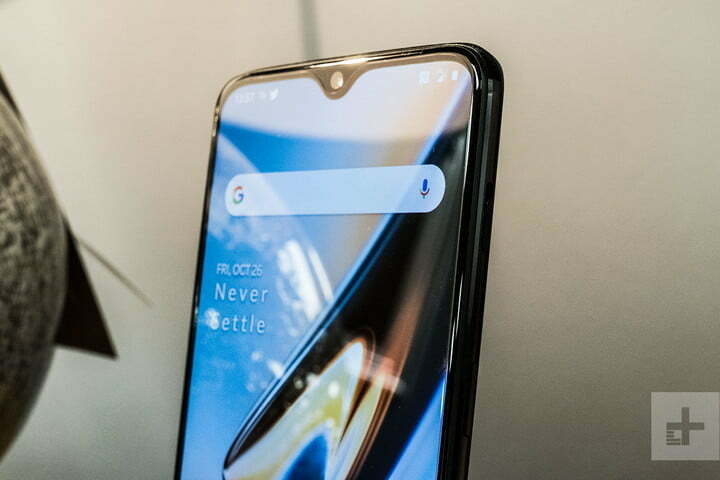 OnePlus’s phones have always closely followed smartphone design trends, and the OnePlus 6T is no different. 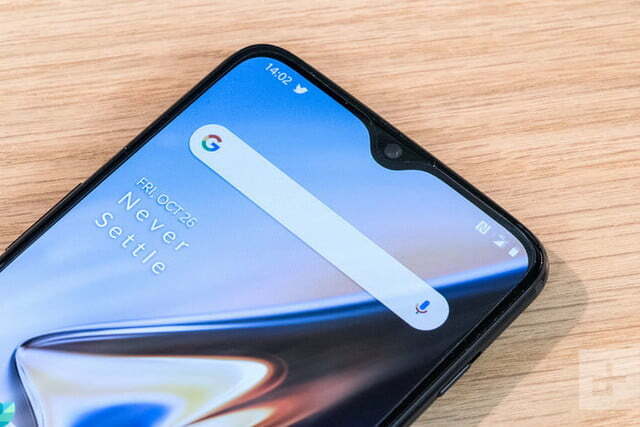 Like the OnePlus 6, the 6T comes with a notched display — but it’s not the same style of notch that we saw in the OnePlus 6. 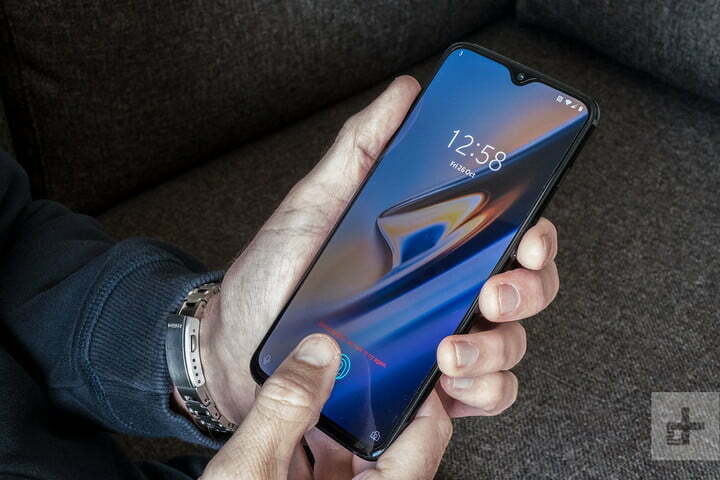 Instead, OnePlus has elected a dewdrop-style notch similar to the Huawei Mate 20‘s notch. It packs a lot into the small size though, and the notch still contains a three-in-one ambient/distance/RGB sensor, and a 16-megapixel front-facing lens with an f/2.0 aperture. We like its subtlety — but if you really hate notches, it can still be hidden through software. The 6T’s bezels are extremely thin, offering a screen-to-body ratio of 86 percent — which means the 6.41-inch AMOLED display utterly dominates the front panel. As an AMOLED panel, the OnePlus 6T’s display will have some deeply gorgeous blacks and vibrant colors, and OnePlus has also added a monochrome Reading Mode, and a blue light-cutting Night Mode. OnePlus’s lauded mute switch is in the same position, and — flipping the phone over — you’ll find the two vertically stacked camera lenses, much like the OnePlus 6. But it’s not all the same for the back panel’s design. You’ll no longer find a fingerprint scanner stuffed under the camera lenses, and it hasn’t returned the bottom of the front bezel. Instead, OnePlus has embraced the future and incorporated an in-display fingerprint scanner. Simply press your finger against the fingerprint icon on the screen, and your phone will unlock. Hold down on the same spot, and you’ll also be able to launch apps from a customizable app shortcut menu. You’ll be able to get the OnePlus 6T in two colors — mirror black, and the midnight black that sports a ghostly reflective “S” under the glass. However, a leak has shown a more colorful version, called thunder purple, may be released in the future, potentially as a limited edition. 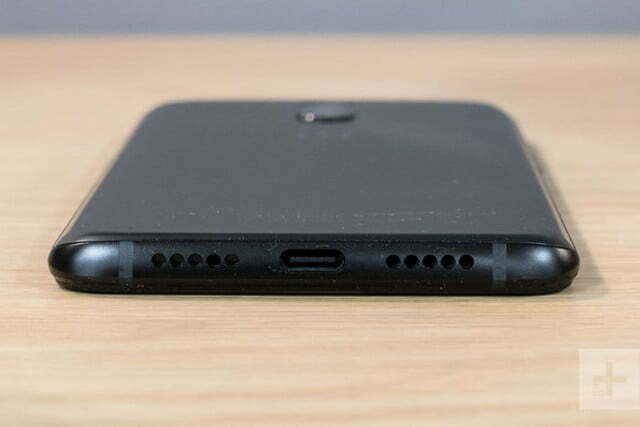 In a first for the OnePlus range, the OnePlus 6T will not be coming with a headphone jack, and will ship with a USB-C to 3.5mm adapter in the box. OnePlus’s party trick has always been to cram the latest tech into a lower-cost package, and everyone expected the OnePlus 6T to continue that tradition. While we won’t see an upgraded processor yet, the OnePlus 6T’s specs are still worthy of a 2018 flagship. You’ll find this year’s top “flagchip,” the Snapdragon 845, loaded into the OnePlus 6T. We’ve seen this chip in pretty much every flagship phone this year, so we’re certain the OnePlus 6T will showcase the incredible power and performance we’ve come to expect from this powerful chip. You’ll get the choice between two models of the 6T; a base model with 6GB of RAM and 128GB of onboard storage, or 8GB of RAM and 256GB of storage. The increased RAM may not boost performance much, but the increased storage may be tempting if you’re a power used — as usual, there’s no option to expand that storage via MicroSD card. The battery has been boosted up to a respectable 3,700mAh. 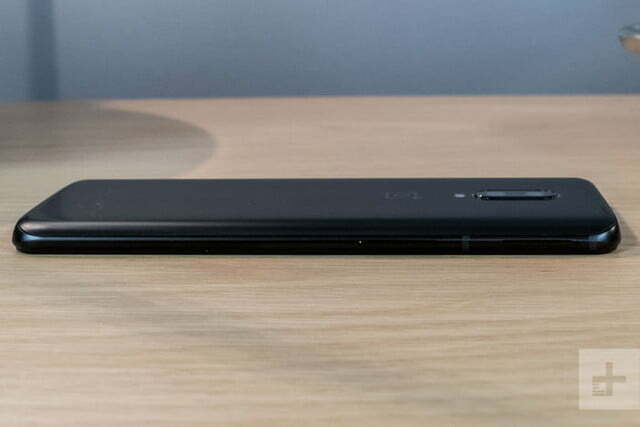 We didn’t have any issues with the longevity of the OnePlus 6’s 3,300mAh battery, but it’s always nice to see a larger battery. You’ll also get access to OnePlus’s stupendously fast “don’t-call-it-Dash-Charge” charging. You’ll find OnePlus’s OxygenOS skin laid over Android in the OnePlus 6T — but with the pleasant surprise that it’s running over Android 9.0 Pie. Some of the largest phone manufacturers haven’t yet upgraded their newest flagships to the newest version of Android, so it’s nice to see OnePlus leading the charge with Android 9.0 Pie. 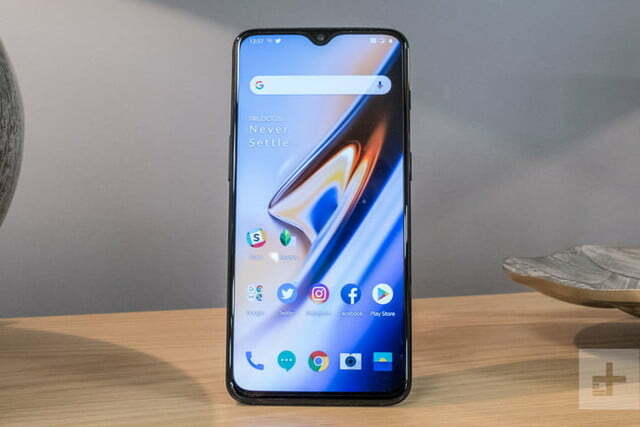 OxygenOS will come with Android Pie’s new gesture navigation, but OnePlus has also put its own spin on it, including some refinements. Users will be able to draw a pause signal on their lockscreen to pause music, or draw specific letters to launch apps. You should see a more responsive phone as well, thanks to the new Smart Boost mode. This feature stores data from commonly used apps in your phone’s RAM, speeding up start-up times by around 5 to 20 percent. According to OnePlus, this is especially useful in apps requiring large amounts of input and output data — which includes games. Games have been given a more direct new feature, too, with an improved gaming mode that reduces notifications, locks the screen brightness, and prioritizes data for gaming performance. It will now show notifications from messaging apps and calls as small floating bubbles, so you can stay updated without impacting your gaming performance. The OnePlus 6T comes with a number of options for biometric unlocking. You’ll have access to the aforementioned in-display fingerprint scanner, but Face Unlock is available too — and OnePlus boasts it can unlock the phone in 0.4 seconds, making it snappier than a crocodile with chewing gum. 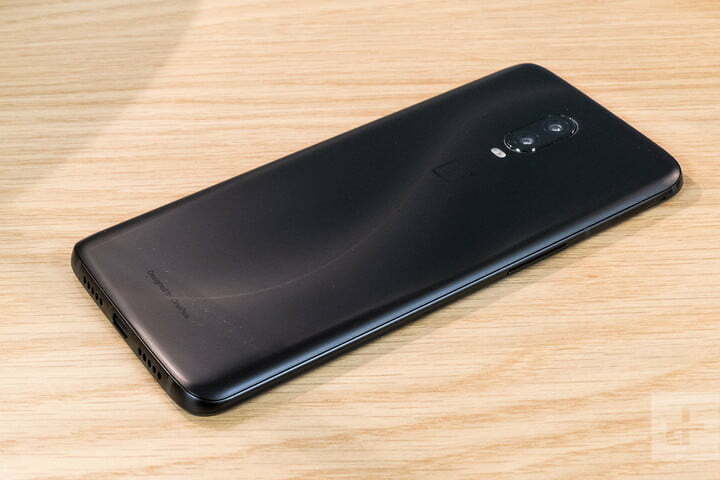 OnePlus has chosen to let one recent trend slip by though — the increased emergence of triple lens systems like those on the Huawei P20 Pro and LG V40 ThinQ — so you’ll just find two lenses on the back of the OnePlus 6T. 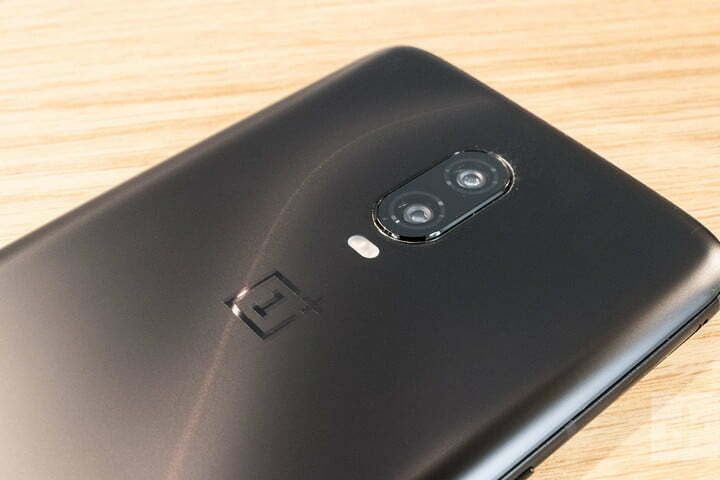 But that doesn’t mean the OnePlus 6T is lacking — on the contrary, the two lenses on the rear of the phone are highly capable. There’s a 16-megapixel main lens with optical image stabilization and an f/1.7 aperture, backed up by a secondary 20-megapixel lens with an f/1.7 aperture. There’s A.I.-driven image recognition available here, too, so the 6T’s camera will be able to recognize scenes and automatically adjust settings to fit whatever is found in the viewfinder. Those adjustments apply to the 6T’s portrait mode, and will even boost low-light performance by recognizing when a night shot is being made, thanks to the new Nightscape tech. Nightscape is also coming to the OnePlus 6. The OnePlus 6T also comes with some impressive video capabilities, too. You’ll be able to capture 4K video at 60 frames per second, but 240-fps slow motion will also be available at 1080p, and 480-fps super slow motion will be available at 720p resolutions. You don’t have to wait any longer for the revolutionary OnePlus 6T — it’s now available, for $549. OnePlus is also teaming up with T-Mobile, making this the first time the phone will be available on a U.S. carrier. You can pick up the OnePlus 6T from T-Mobile for better than half price over 24 months. To find out about that deal and all the best ways to pick up the new flagship killer, check out our OnePlus 6T buying guide. Updated on November 20, 2018: OnePlus 6T phones on T-Mobile are now receiving Oxygen OS 9.0.4. Published on Tue, 20 Nov 2018 17:33:01 GMT, © All rights reserved by the publisher.